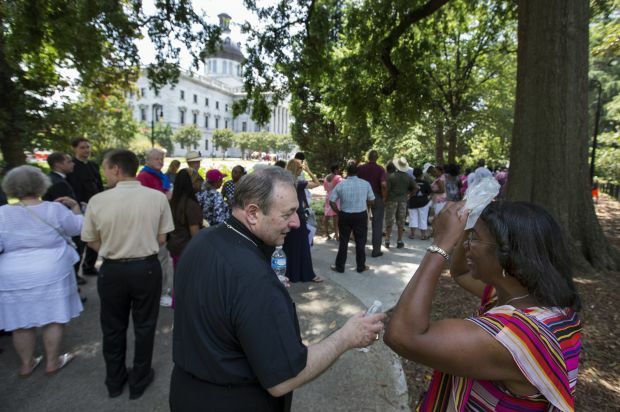 COLUMBIA, S.C. (CNS) — The crowd that poured onto the Capitol grounds June 24 to mourn a slain state senator and pastor, the Rev. Clementa Pinckney, was a tribute not just to him, but to each of the victims shot a week earlier at Emanuel African Methodist Episcopal Church in Charleston. Bishop Robert E. Guglielmone of Charleston and several men and women religious were among the massive crowd who came to demonstrate their support to the families and the community. They included Fathers Richard Wilson, Bernard Kyara, Gary Linsky, Renard West and Andrew Trapp; Will Frei, seminarian; and Sister Nancy Hendershot, who is member of the Congregation of Sisters of St. Agnes. “I’ll make it with prayer,” she said, adding that the experience was well worth it. “If everybody in the world was as nice as the people I’ve come across since I’ve been here, it would be a better world,” she told The Catholic Miscellany, newspaper of the Diocese of Charleston. Horace Gillins from West Columbia and Margaret Grayson from Greenville came to support the campaign that all lives matter, and pointed out the historical significance of the day, noting that Rev. 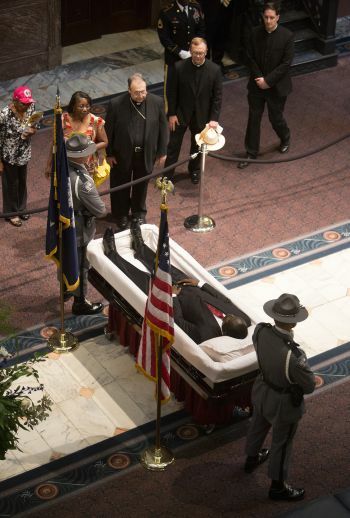 Pinckney, who was 41, is the first African-American to lie in state since Reconstruction. The last person to lie in the rotunda was former Gov. Carroll Campbell in 2005. Rev. Pinckney’s widow, Jennifer, and his daughters, Eliana and Malana, followed the casket into the Statehouse. Senators and House members took turns standing by the casket, each wearing a blue-and-white ribbon with the state crescent — a symbol of unity made by State Sen. Katrina Shealy. They greeted the public with handshakes and hugs, often struggling against tears themselves. President Barack Obama was scheduled to deliver the eulogy and memorialize the other eight victims at the June 26 funeral for Rev. Pinckney at the TD Arena. In Charleston June 19, participants in a prayer circle at Neighborhood House held hands under a blazing sun Friday and called for God to bring us peace, help us heal and love one another. “Everyone needs to be a messenger of love to all people, with no age or race barriers,” said Pastor Kay Colleton with the Manna Life Center. She was speaking specifically to the shooting of nine people at Emanuel Church, although the prayer outreach had been planned for many months and covered a broad scope. Father Joseph Romanoski spoke in the homily about a time that he himself felt anger and hatred toward someone who wronged him. He said it is normal, but urged people to turn away from that path and do the right thing. Everyone, the priest said, must stay connected to the source of love and life and turn away from hatred. Wise Taylor is a reporter at The Catholic Miscellany, newspaper of the Diocese of Charleston.